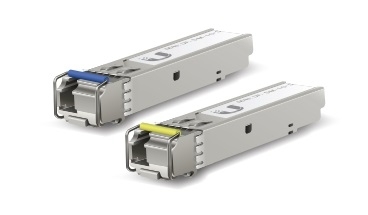 UF-SM-1G-S-20 is 10 sets of singlemode 1G SFP+ WDM modules with 1 LC connector. Package contains 10 x Blue + 10 x Yellow module for a complete / functional pair. Deploy a BiDi (BiDirectional) model, UF-SM-1G-S-20 or UF-SM-10G-S, to maximize re-use of existing infrastructure. You must deploy a BiDi model as a paired set of modules because the pair uses two different wavelengths, upstream and downstream, on a single fiber.